While studying at the ENT Clinic, Korgialeneio-Benakeio General Hospital, I worked in by PhD thesis on “The anomalies of the first branchial cleft”. It is an interesting topic in terms of theory, diagnosis and mainly surgery, due to the relationship between these anomalies, the large cervical vessels, the facial nerve and the middle ear. The thesis was presented and approved in 1984. While serving in many public hospitals, he actively participated in training interns both on a theoretical and a practical level (diagnostic approach & surgical treatment). At Laiko Hospital, he was responsible for granting full specialty to five interns. He has participated in a large number of postgraduate seminars, classes and round tables. He taught Otolaryngology in nursing schools for a number of years (Pesmazogleios Professional Nursing School, Intensive Training for nurses & Professional Nursing School of the Korgialeneio-Benakeio General Hospital. He has also participated n the annual program for interns at the Athens University ENT Clinic for a number of years. 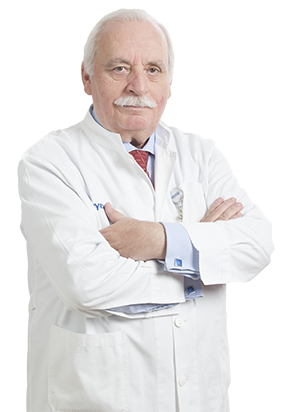 He has participated in 102 conventions and other scientific events in Greece and abroad with announcements, speeches, round tables, video presentations and posters. He has presented 181 announcements, most of which have been recorded in conference minutes, as well as Greek and foreign journals. He has also presented 32 research studies in the form of e-posters, 17 movies in super 8, 16 & 21, video & CD. He has participated in 43 round tables as speaker and 7 as coordinator. He has also given speeches and lectures in scientific events. While working at the Henry Dunant Hospital ENT Clinic, he organized 3 postgraduate seminars with live broadcast of surgeries he was performing. As Director of the HYGEIA Hospital Head & Neck Clinic, he has organized 2 meetings on endoscopic nasal & paranasal surgery. Each year, he participates in speeches and presentations of interesting cases at in scientific meetings of doctors. He has published 25 studies in Greek journals and another 12 in foreign ones. His study entitled “Missbidugen der erten Kiementurche und des Nervus Facialis” was included in the book Speicheldusen Krankheiten by Professor A. Miehlke (1984, p. 76).